Meet a cycling android, a remote-controlled orb, and other robotic curiosities from last week’s Consumer Electronics Show. 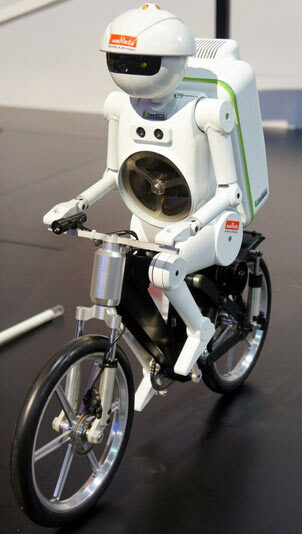 Murata Boy, made by Japanese electronics manufacturer muRata, was built to showcase the company’s sensors and other technologies. The cycling robot stands 50 centimeters high and can stay balanced on the bike even when it’s stationary, thanks to the flywheel in its chest; input from gyroscopes and accelerometers provide it with a sense of balance. The robot can recover if given a light shove, can ride up a 25-degree slope, and can go backward. The most recent version of Murata Boy showcases its maker’s energy-efficient technologies—it can be charged wirelessly and enter an efficient sleep mode. Sphero is a remote-controlled sphere about the size of a baseball that can be steered around at speeds of up to three feet per second using an iPhone or iPad app. Spinning, weighted components inside the ball let it roll around and change direction. Sphero is made by Orbotix, based in Boulder, Colorado. It contains a Bluetooth receiver, an LED light, a compass, a gyroscope, and accelerometers. 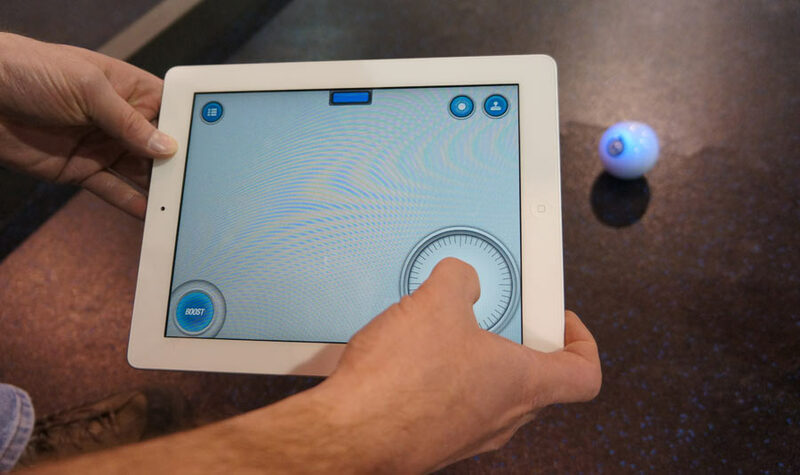 Orbotix has released an application programming interface that lets outside developers create apps for the ball. This should result in some novel new Sphero behaviors and games. The Xybot turns an ordinary iPhone into a mobile avatar. 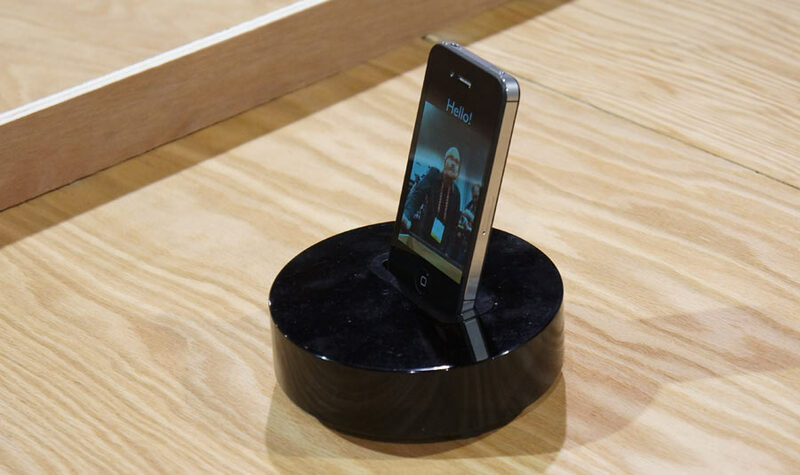 A phone docked into the robot streams video of the person controlling it using an app running on another iPhone. Xybotyx of Littleton, Colorado, which makes the robot, was founded by two engineers who met while working on NASA’s Phoenix Mars rover. The Xybot will be released in March at a price of $111.11. 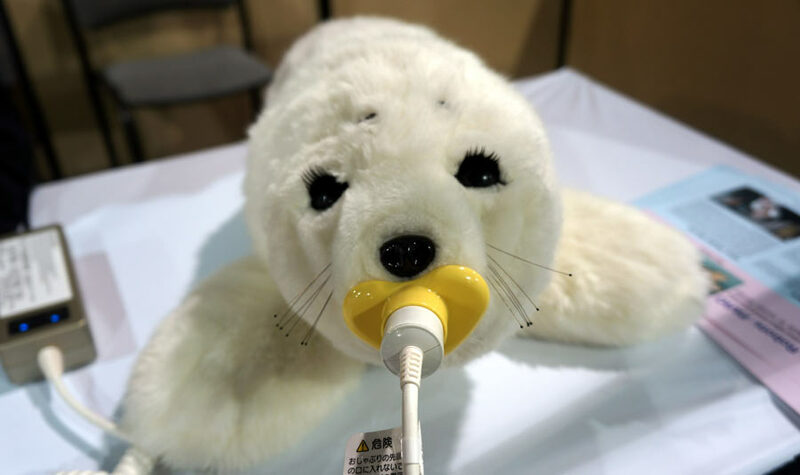 Paro is a robotic seal designed to offer therapy to people in a hospital or long-term care. Its soft, antibacterial fur hides a frame that can move its body; dual computer processors and sensors allow Paro to respond to light, touch, sound, and temperature. Paro can learn, and it will repeat actions that are rewarded by petting and avoid actions that lead to an admonishing tap. Paro was first developed at the National Institute of Advanced Industrial Science and Technology in Tsukuba, Japan, where researchers found that Paro can improve the mood of elderly people living in nursing homes. The robot can be leased in the U.S. for $200 a month. 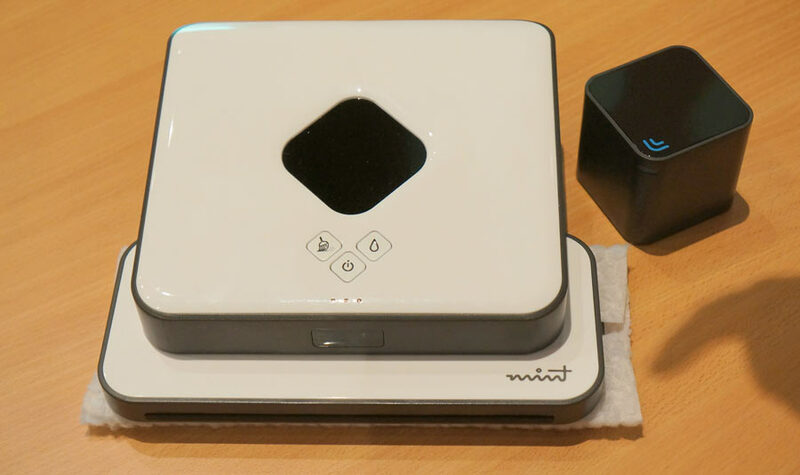 Mint is a robot that can sweep or mop hard floors. It was created by ex-NASA roboticists at Evolution Robotics, based in Pasadena, California. The robot comes with a small navigation beacon that projects two invisible infrared beams onto a room’s ceiling. The robot uses those signals to determine its position, a bit like using GPS satellites. It learns the layout of a room as it explores it for the first time. That allows it to navigate around the edges of the room and avoid obstacles like furniture. The Survey Runner made by Topy of Tokyo is designed to help out after a nuclear accident. 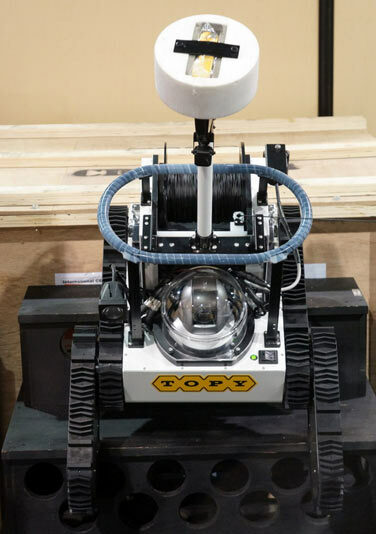 The 88-pound (40-kilogram) robot can climb up stairs or over rubble, and carries two wide-angle cameras and a radiation sensor. If the robot needs to work inside heavily shielded nuclear facilities, it may not be able to communicate using radio. If that’s the case, a thin, tough, fiber-optic cable that trails from a reel lets the robot’s operators stay in touch. 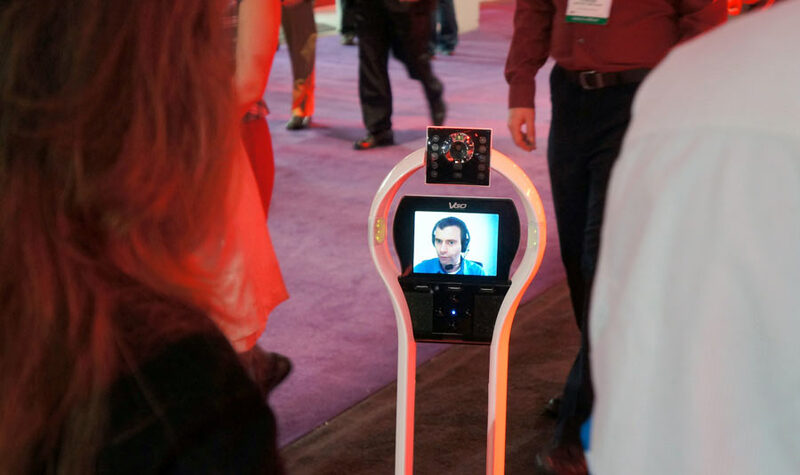 This telepresence robot made by VGo Communications of Nashua, New Hampshire, escaped its booth and roamed the floor, chatting with CES attendees. 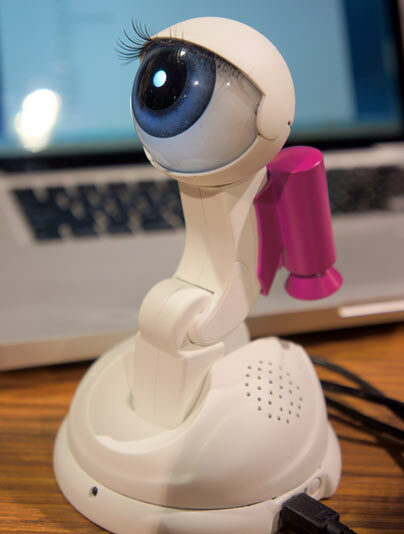 The robot is controlled using a program for the PC that lets its operator see and interact with people more naturally than with conventional videoconferencing, which is tied to a specific location. Boston Children’s Hospital is testing VGos as a way to stay in touch with patients after they go home. A VGo robot costs $5,995, plus a $1,195 annual service contract. Read our review of what it’s like to work remotely using a telepresence robot. YurBot plugs into a computer and becomes a kind of emotional avatar. The robot sleeps when the computer sleeps or is turned off, signals when new e-mail arrives, and dances when music is played, among other things. YurBot is made by Innvo Labs, based in Hong Kong, and should become available in 2012, although the price has not yet been announced. 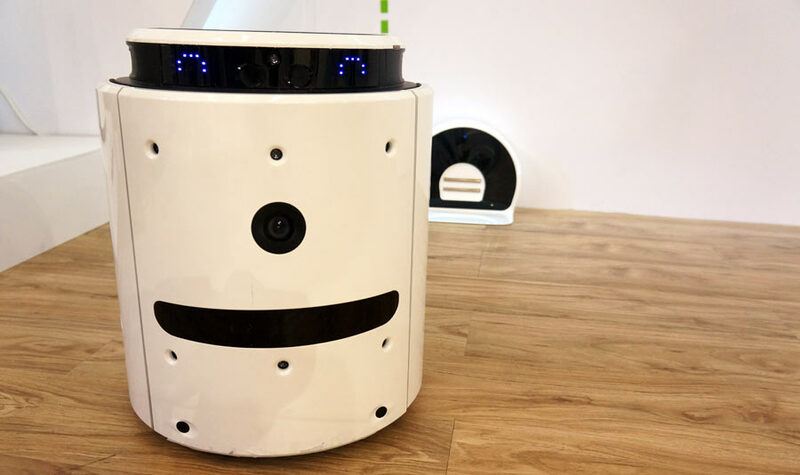 This robot, called the Rydis H1004 II, roves around its owner’s home and filters the air as it goes. It is also designed to act as a safety system for elderly people living alone. It connects with a wrist band that can detect a fall, and can call for help if one occurs. The robot is made by South Korean company Moneual. It should arrive in the U.S. later this year, and will cost around $1,000.